Yes it is still clean but that is because nobody has used it in over a month!!! The worst part is that S confessed last week at breakfast that he had read my post days after I wrote it! So here we stand....the sink is still clogged and S's schedule is back to CRAZY. 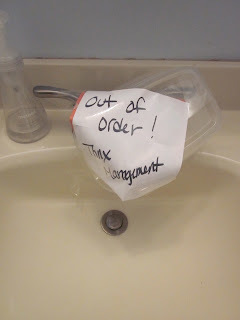 I don't think I will ever wash my hands again in my own bathroom unless I unclog it myself (don't worry, I rarely use this bathroom anymore and if I do, I go down the hall to the kids bathroom and wash up in there ;). On a more positive note, I just sold off the last of my classroom on ebay this week. I have downsized from 30 large rubbermaid totes to only 2 (stuff I kept for the kids) :) It feels so good to have gotten rid of it all and our basement has a lot more room! Wow! You got rid of a lot of stuff! We have a similar issue with a toilet in the kids bathroom. I've marked it unusable. No matter how often Mick comes to fix it....it still plugs up. Sounds like my living room ceiling that has been scrapped since last spring. We have some progress, but not enough for ME.